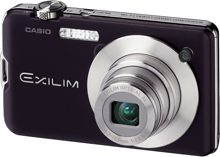 The Casio EXILIM Card EX-S10 is a 10.1 megapixel super slip camera with a 3x optical zoom lens and 2.7 inch LCD. The Exilim EX-S10 features a motion blur detection (taking a picture when the camera detects a still subject) and also smile detection (as well as some other innovative auto detection modes). The Casio Exilim EX-S10 also is iTines compatible with H.264 video. The EX-S10 is 94.2 mm wide, 54.6 mm high and 15.0 mm thin, weights 113 grams and comes in red, blue, silver and black, and will have a retail price of $249.99 USD. Casio’s EXILIM series was born with the appearance in 2002 of a “wearable card camera” — a digital camera with a very slim form. The new EXILIM Card EX-S10 maintains all of the powerful functionality of the cameras that were later developed in that line (high pixel count, zoom functionality, LCD monitor, photo functions, etc.) but it also embodies a return to a stylish thin form and a strong design presence. The camera’s stylish body, measuring 94.2 mm wide, 54.6 mm high and 15.0 mm thin (13.8 mm at the thinnest part) is the product of Casio’s relentless pursuit of thinness. It is finished according to two design requirements — a high quality feel created by the stainless steel body, and a unique beauty derived from its coloring. The camera comes in four colors — red, blue, silver, and black. This new camera’s thinner, smaller body was made possible without sacrificing high resolution image quality using a newly developed 1/2.3 inch CCD. Its high resolution images can be used to create beautiful prints even when enlarged or when the image is cropped. The camera incorporates Casio’s newly developed Super Clear LCD. This produces extremely sharp and vivid images, thanks to its high contrast ratio and its 230,160 dot high resolution. The display can be viewed easily from above, below, left or right thanks to its wide viewing angle, and it is extremely bright, making it easy to see even in daylight. The camera uses the H.264 video standard, which utilizes the AAC audio codec widely enjoyed in Apple’s iPod, etc. It is also possible to record movies in an appealing wide format. The camera also features a Movie Button which makes movie recording easy.